Sometimes we all struggle with finding the perfect words for a birthday greeting. Just remember, it’s definitely the thought that counts – the recipient is not going to analyze your words. He or she will just be happy that you remembered to send a card! I’ve tried to include a variety of sentimental and humorous messages that are appropriate for almost anyone. Enjoy your special day! May your wishes come true…and may your wife (husband) not find out! Like fine wine, your value increases year after year. Happy 75th Birthday! Birthdays are nature’s way of saying we need to eat more cake. Have a wonderful 75th! Don't think of it as turning 75. Think of it as turning 18 with 57 years of experience. The secret of staying young? Live honestly, eat healthily, exercise, and most importantly – lie about your age! Happy 75th birthday! May you find the strength and courage needed to blow out all those candles. Don't get all weird about growing older! Age is simply the number of years the world has been enjoying us. You know you're getting older when your childhood toys are now collectibles and antiques. Happy 75th Birthday! A birthday is a good time to remember our friends. At our age, it’s good to remember almost anything at all! Blowing out 75 candles is great exercise for the lungs! I just wanted you to know how grateful I am for all you have done to make me what I am today. I love you, Mom! On your birthday I'd like to say that the little things you did for me have always made the difference. Wishing you a happy 75th birthday! Thinking loving thoughts of you, Mom - and wishing you a day that's as special as you are! Dear Mom - No one could love me more or understand me better. No one can inspire me more or hug me tighter. Happy 75th Birthday! Thank you Mom, for making my childhood so special. I remember every minute of it. May God pour all His love and warmth on you on this special birthday. I simply cannot think of a better mother than you. I'm so glad you're mine! Happy 75th birthday! You are my teacher, my support and my strength. You made me believe in me. I wish you the best birthday ever! I'm so blessed and grateful to have such an amazing Mom like you. I hope your 75th birthday is as wonderful as you are! Dear Mom, On your birthday I want to say again how very much I appreciate all that you have done for me. Have an amazing 75th birthday! Happy 75th birthday to the world's best Mom! God has truly blessed our family with you, Mom. I hope all your birthday wishes comes true! Happy 75th Birthday, Mom! I hope that you have felt very special today and that you know how much you are loved. I am so thankful for you, and I love all the wonderful times we have shared together. You've brought so much joy and happiness to my life. I love you, Dad - Happy 75th Birthday! No gift could ever show the amount of love and respect I have for you. You were, you are, and you will be the best dad ever. Happy 75th birthday! I just want to thank you for all the valuable lessons you've taught me over the years. You're the greatest gift God has ever given me. The best dad in the world deserves a special greeting from his favorite daughter. Happy Birthday, Dad! You have shown me so much love and support all my life. I love knowing that I have the best Dad in the world. Thank you for being my guide, my strength and my support. I hope your 75th birthday is as incredible as you are! All the wonderful times I've spent with you will be sweet memories for the rest of my life. You are my strength and inspiration. I feel that I am the luckiest person I know to be raising by such a loving, caring and providing father. You're the best Dad ever! There is no bond like the one that ties a child and father together. I feel so lucky to have such an amazing father. Happy 75th birthday! Your 75th birthday is the perfect time for me to say how very grateful I am to you for always showing me the way. Thanks for all that you do for me, Dad! Dad, you've brought me some of the most precious memories and happiest moments of my life. I hope that your 75th birthday is full of wonder! I hope your 75th birthday is filled with love, joy, fun and care. I am so thankful to have you as my father. Having a friend like you makes my life so much happier! Have a marvelous 75th birthday! I hope you find plenty of reasons to smile on your 75th birthday and throughout the year. I hope this special birthday brings much joy and happiness – you deserve it! This birthday greeting is filled to the brim with loving thoughts, sweet memories, wonderful dreams, and tons of happy smiles. Happy Birthday to the most beautiful (handsome) 75 year old I have ever seen! You’ve brought so much joy and happiness to my life – I hope your birthday brings you everything you’re dreaming of. Wishing you a day this is as special in every way as you are. It’s your special day – you deserve to enjoy every moment of it. As you celebrate the joys of 75, may you be surrounded by love, may you find many peaceful moments, and may you be blessed with happiness. You are always in my prayers and thoughts, and I wish you the best on your special day and every day. Happy 75th birthday! I am so thankful for you and all the wonderful times that we’ve shared. 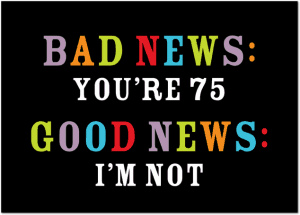 75 looks fabulous on you! Now that you’ve reached that vintage age of 75, you’re considered a real classic! Take some time to enjoy your special day. Here’s wishing you a prosperous, bright, and fun-filled 75th birthday! I hope you’ll enjoy today, whatever you do, and that your day will be special – just like you!